Miren quien apareció en un blog de fotos de gatos. La más hemosa, Hester. Mi preciosa. La foto se la tomé hace unos días. 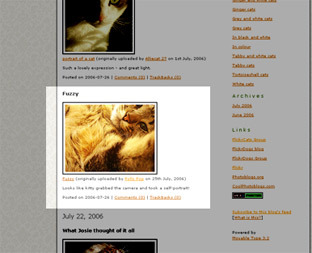 This entry was posted on julio 27, 2006 at 5:15 am and is filed under Uncategorized. You can follow any responses to this entry through the RSS 2.0 feed. You can leave a response, or trackback from your own site.